The concept of utilizing feedlot manure in an anaerobic digester to power an ethanol plant, which then produces feed for cattle, has been called a closed loop system. In this system inputs are minimized and outputs are used by another component. This research looked at differences in manure quality within this system. Trial 1 considered incorporating distillers grains into the cattle diet and the effects on methane potential of the manure. For this system to be utilized by the feedlot industry in Nebraska, the manure collected for anaerobic digestion must be collected from soil-based open feedlot pens which account for over 95% of the feedlot cattle raised in Nebraska. Trial 2 addressed the methane potential of open-lot feedlot manure and its feasibility for anaerobic digestion. 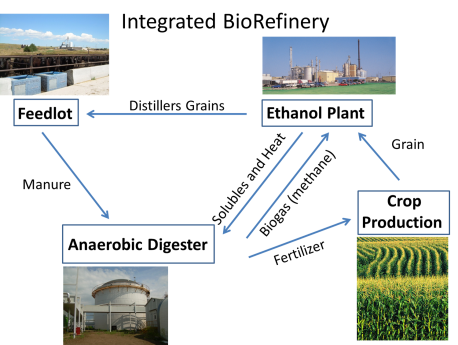 An integrated biorefinery utilizes distillers grains for cattle feed and cattle manure for biogas generation to power an ethanol plant. This system has been referred to as a “closed loop” system due to energy recycling within the segments. Seven continuously stirred anaerobic digesters were used to compare degradation of manure from 2 cattle diets (Trial 1) and 2 cattle housing methods (Trial 2). In Trial 1 manure was collected from confinement cattle on a control diet with 82.5% dry rolled corn or 40% of the corn was replaced with wet distillers grains plus solubles (WDGS), a byproduct of the ethanol industry. For Trial 2, manure was collected from cattle in complete confinement or soil-based open feedlot pens with all cattle on a similar byproduct diet. In both trials, organic matter (OM) degradation and methane production was measured for digesters on each treatment. In Trial 1, samples of effluent removed from the digesters were also used to identify differences in microbial community structure (Eubacterial and Archaeal) due to treatment. Trial 1. Organic matter degradation was slightly improved for manure from cattle fed WDGS (P = 0.10). Methane production was 0.137 L/g OM fed for WDGS manure and 0.116 L/g OM fed for the corn-based diet (P = 0.05). Microbial communities identified using 454-pyrosequencing revealed structuring of the microbial community based on diet (P < 0.001). This suggests that the microbial food chain that contributes to methane production is greatly influenced by the diet fed to cattle, and dietary manipulation may provide opportunities to increase or decrease methane production from cattle manure. Trial 2. Manure collected from open-lot pens had an OM content of 26% compared to 88% for manure from complete confinement. This resulted in decreased methane production and OM degradation (P < 0.01) for digesters fed open-lot manure. However, methane was produced from open-lot manure suggesting that if ash buildup can be avoided open lot manure may be a viable feedstock for anaerobic digestion. We are currently exploring new technologies that may enhance the use of open lot manure in anaerobic digestion. We are also identifying key microbes involved in methane production in order to better understand how things such as cattle diet affect methane production. A summary of these trials is available at beef.unl.edu/reports; 2013 Beef Report pg. 98-99.